Almost every investor eventually considers the question: which is the better investment, property or shares? The answer isn't as simple as one or the other, since both asset classes offer different benefits and risks. And if the best answer is a mix of the two, how do you strike the right balance for sustained returns? This book takes an unbiased look at these two asset classes, explaining the risks and benefits of each, dispelling stubborn myths, and giving you the facts you need to find what’s best for you and your portfolio. 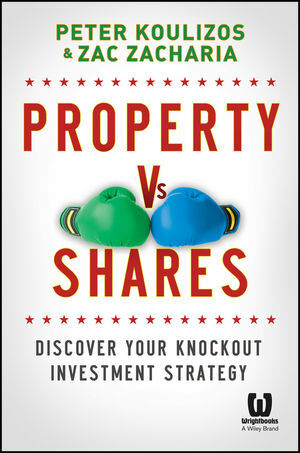 Offering a point-by-point comparison of shares versus property, this easy-to-read guide argues that a combined strategy is smartest and safest for most investors. It then goes on to give you the information you need to tailor your portfolio to your own level of acceptable risk versus desired reward. Every portfolio should be different, depending on your own individual goals and needs. With this handy guide, you can find the right mix of assets to achieve healthy and consistent returns. Peter Koulizos is the author of The Property Professor's Top Australian Suburbs. He is a lecturer in property, a highly sought-after speaker and a contributing writer to News Limited, www.realestate.com.au and Money magazine. Zac Zacharia is founder and managing director of financial services company, The Centra Wealth Group. He is a lecturer in share investment at TAFE SA and a trainer for Kaplan. Zac is a regular speaker at investment seminars and contributes to numerous publications including inBusiness magazine, The Advertiser and the Sunday Mail.